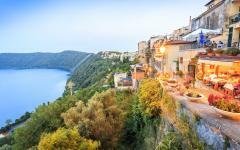 Immerse yourself in the unparalleled Italian mastery of artisanal crafts, fashion, cars, food, and wine. 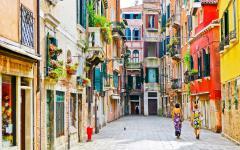 Your personalized 11-day Italy tour celebrates the intricate details of artisan studios specializing in glassblowing, silk, wine-making as well as the handcrafted marvels of world-renowned luxury brands of extravagant cars and couture fashion. Whether sampling Parmesan cheese inside the factory, mixing aromas to create a personalized perfume or hearing the first roars of a Ducati straight off the assembly line, you will have exclusive access to the diverse world of products made in Italy. 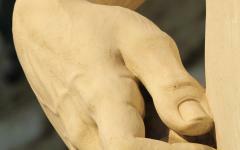 Your exclusive Italy tour does more than just observe the historic machinations of the artisans who have shaped production across Europe. The development of machinery has only deepened the level of sophistication needed to complete handmade works of internationally renowned in the tradition of Italian artisan craftsmanship paying careful attention to intertwining beauty and function. Engage in the charm, passion, and splendor of the intricacies of Italian heritage involved in making different products by hand from start to finish to craft world-famous products. The exploration begins with your arrival at Malpensa Airport in Milan. A full day of fashionable discovery awaits you in the city known for its fashion-forward ideas. Follow your guide on a private tour of the Armani Silos, which represent more than 40 years of the iconic brand started by designer Giorgio Armani before venturing through the Fashion District with a personal shopper on Via Monte Napoleone, the most famous shopping street in Milan’s fashion district, to discover the newest chic, modern styles with classic designs. 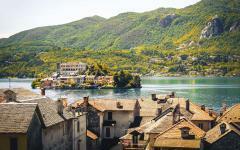 Travel to the charming shores of Lake Como for a day as seamless as silk. 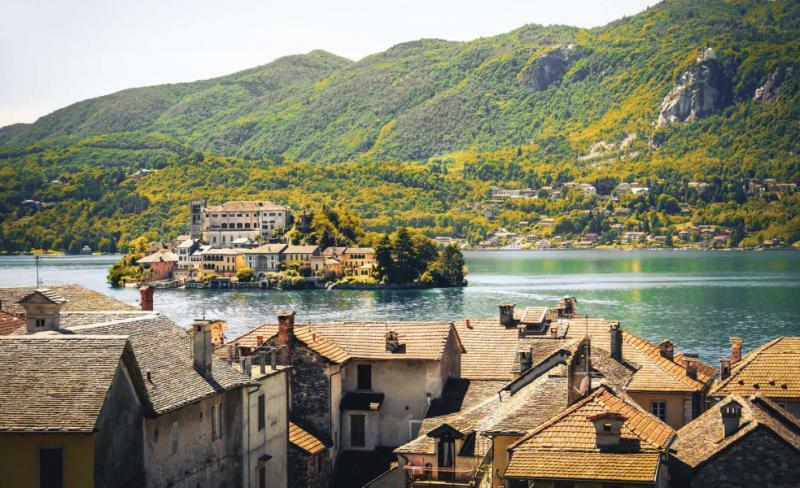 The town of Como hosts one of the world’s most highly-sought silk trades, which host factories, stores, and a museum dedicated to the technique and material in Como and their evolution over time. Wander the factory grounds and spend time perusing the offerings in the factory shops before returning to Milan. 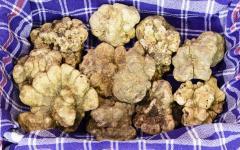 Truffles are nearly synonymous with Italy, especially in the region of Piedmont. Delight in a half-day tour combing through the countryside of Alba on a guided hunt for white truffles. 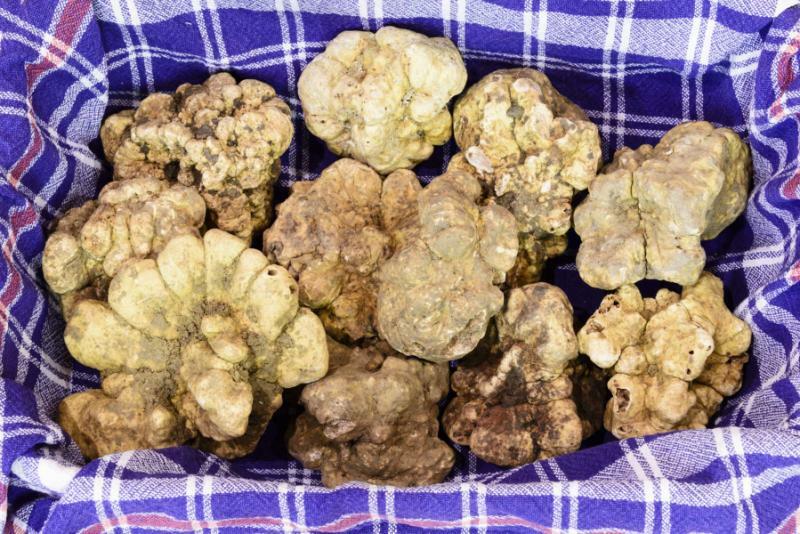 As the white truffle capital of the world, a lunch here highlights the delicacy and showcases the ways fresh truffles can accentuate flavors. 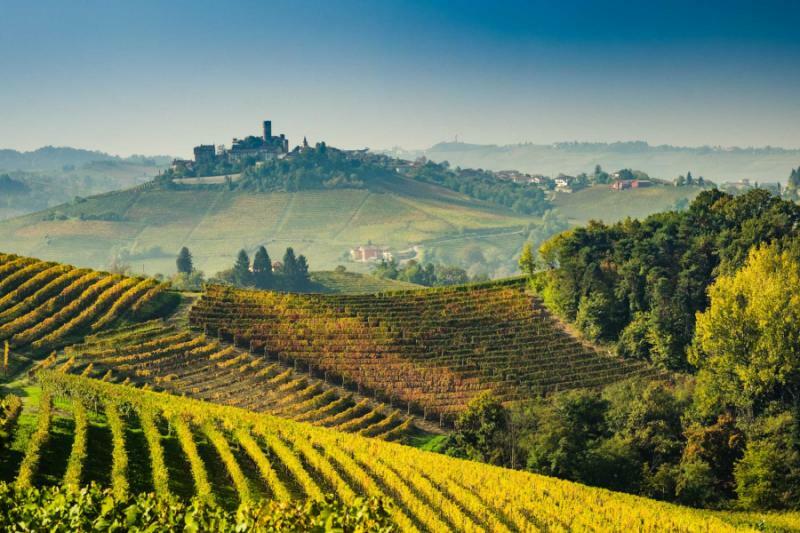 The remainder of the day leads you through the Barolo wine region where you can sample the magnificent wines cultivated on family-owned vineyards. Italy is known for its attention to the cuisine, paying special attention to simple yet captivating flavors with few regions better known for their culinary influence than Emilia Romagna. Visit a Parma ham farm to learn about the methods used to create the perfect prosciutto and follow the traditional process of crafting seductive balsamic vinegar. 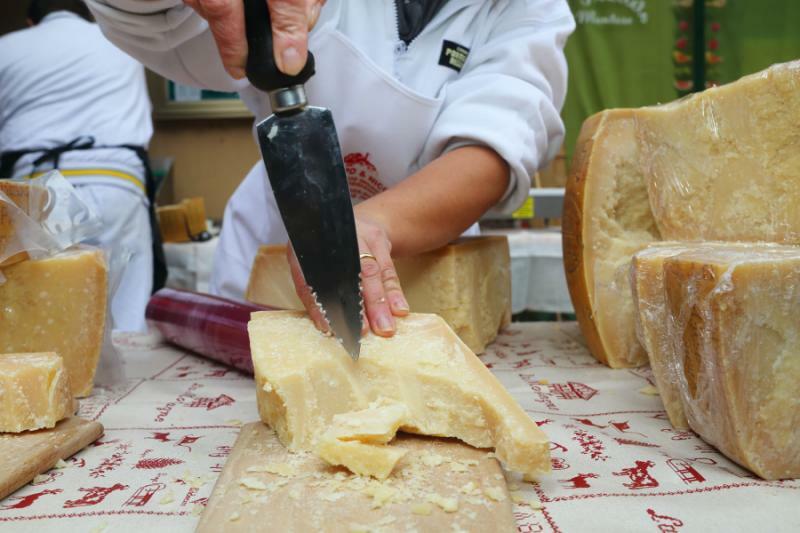 Indulge in the crumbly, grainy texture of Parmesan cheese after learning about the entire cheese-making process, from milking the cow to aging the wheel, and even cutting open the cheese properly for continual quality control. 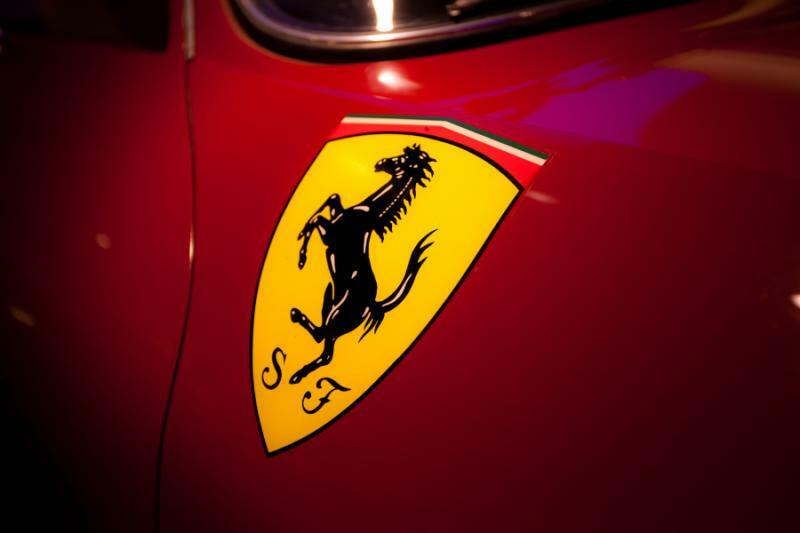 While the Emilia Romagna region might best be known for its gastronomy, it is also home to Italy’s “Motor Valley,” the headquarters of prominent Italian racing brands such as Ferrari, Lamborghini, and Maserati. The exclusive luxury motorcycle brand Ducati allows you to witness the insight and artistry that engineers and designers use in shaping power, speed, and style. Explore the intricacies of Italian cuisine at Eataly, the theme park focused on the regional recipes and famous delicacies of the country, allowing visitors to view the process of crafting pasta, cheeses, and specialty dishes. Pasta lovers can even visit the Barilla Pasta Factory, the largest pasta factory in the world, and discover how the Italian staple is made as the scent of freshly made pasta surrounds them. 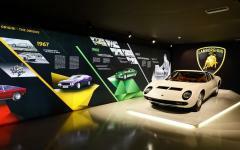 The region of Emilia Romagna also hosts the Ferrari Museum, in which you can roam through over 70 years of design while enjoying interactive exhibitions. When in Motor Valley, you have a variety of options to explore beyond just one luxury Italian racing brand. You could tear through a private race track in a Ferrari, visit the Pagani or Lamborghini museums, which also offer access to their respective factory floors, or you could choose to forgo spending time with Italy’s famous luxury cars to indulge in a private cooking class in which you will visit a local market and learn the traditional methods of crafting regional pasta, appetizers, and desserts. Florence is a city of Renaissance beauty and medieval walls but still manages to a sense of its artisanal spirit, as demonstrated in the neighborhood of the Oltrarno, which means “beyond the Arno.” Follow your guide through the winding cobblestone streets on a city tour that reveals the leather stores and jewelers around the Ponte Vecchio and San Lorenzo districts. 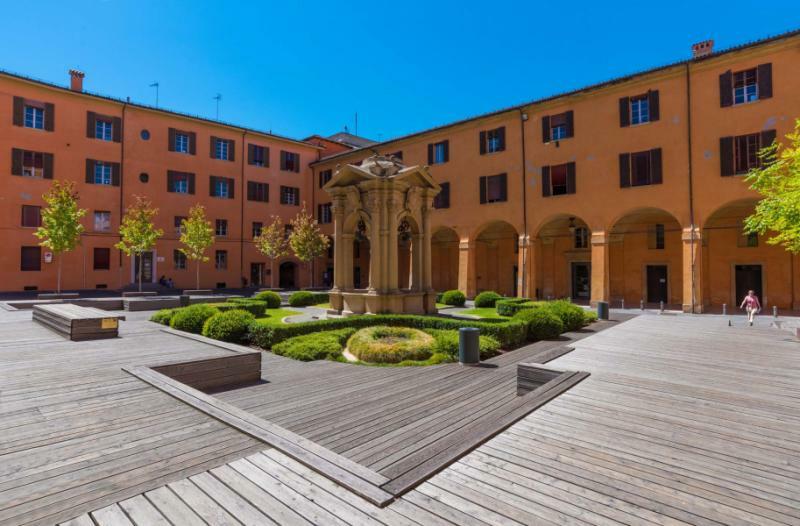 You could also explore the artisan shops of the Oltrarno before meeting with a master perfumer who will help you experiment and concoct your own personalized fragrance. 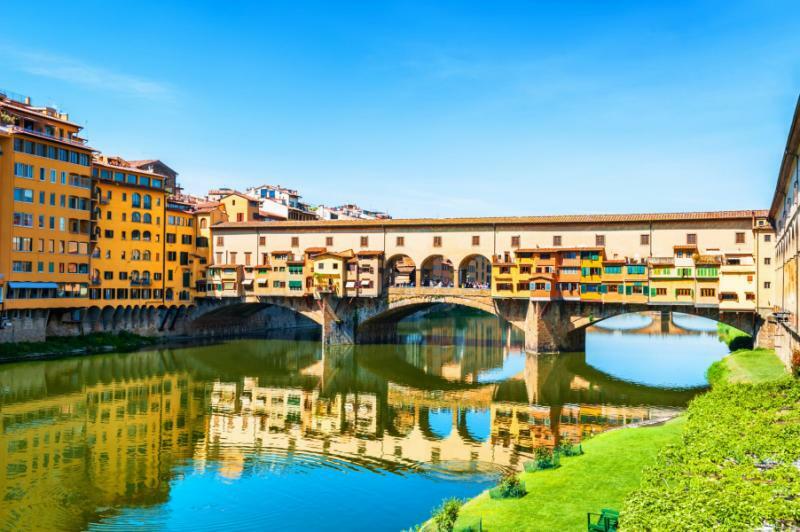 Continue your journey of interacting with artisanal masters by meeting jewelers who have shaped their own distinctive styles on the Ponte Vecchio. Traverse the galleries of the fashionable Ferragamo Museum, which displays the trends of the notable designer Salvatore Ferragamo, spanning from the 1920s to 1960. 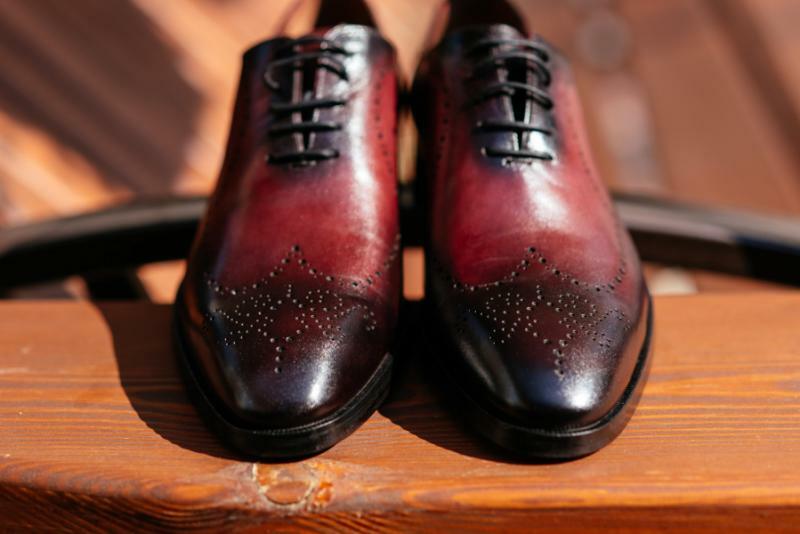 You will also spend time with an artisan shoemaker who works with patrons to design, shape, and construct a custom shoe to the guest’s specifications. On the way to Venice, you stop in the town of Arzignano, a well-known area for historical tanneries offering insight into the value of the traditional tannery process and how the methods have evolved over the centuries. 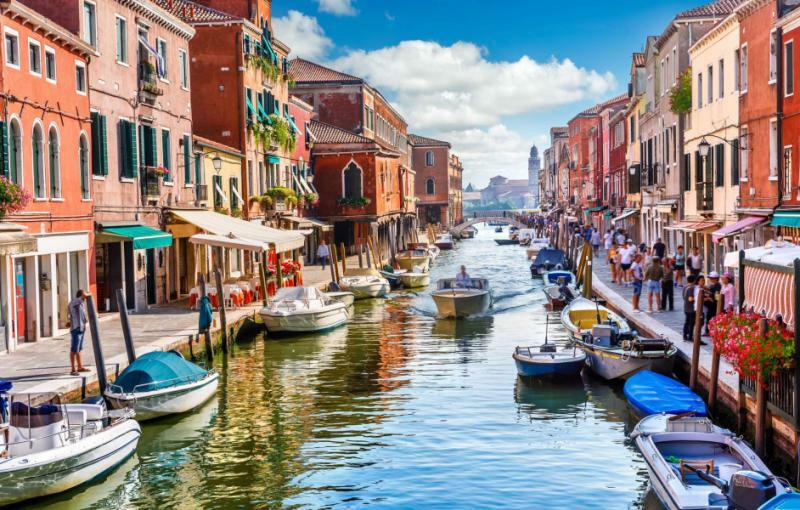 Venice hosts a multitude of islands within the eponymous lagoon, including the islands famous for the artisan crafts of glassblowing and hand embroidery, the islands of Murano and Burano. They contrast the greater island of Venice in their subtle, quiet charms emanating from the continued artworks that have become cultural staples over time. 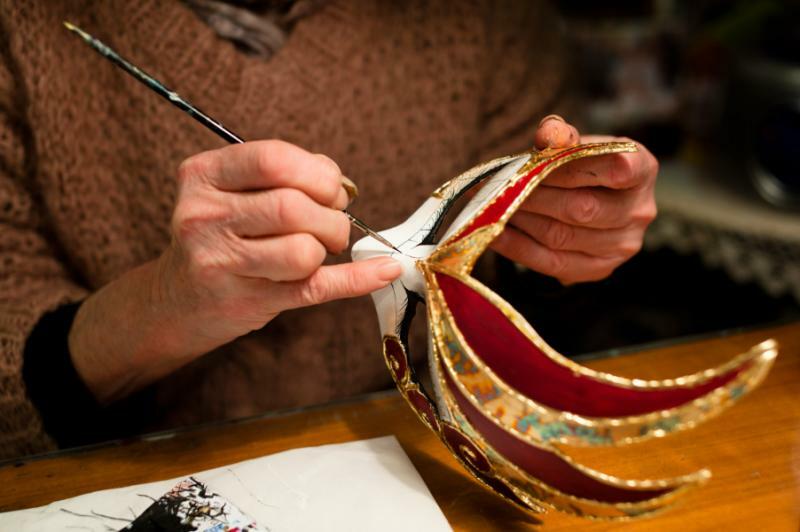 Take your time visiting the islands and participating in the demonstrations of the craft before returning to Venice with time to stroll over the iconic bridges arching over the canals. 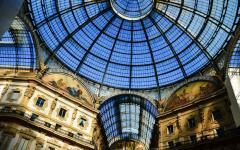 The fashionable city of Milan embodies elegance and sophistication in the poised remains of the historical architecture, chic décor in trendy cafes and restaurants, and the blend of fashion styles local Milanese model on a daily basis. Your flight lands at Malpensa Airport, where your private transfer greets you upon your arrival. 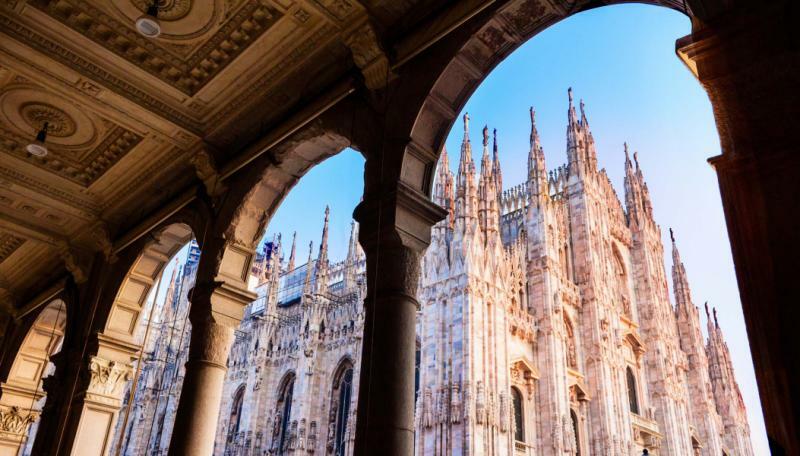 While Milan maintains a reputation as Italy’s business center, the city displays rich cultural heritage at its core emanating from the Piazza del Duomo. Construction on the Cathedral of Santa Maria Nascente began in the 14th century and finished after nearly six centuries, being the third largest church in the world. The scent of fresh espresso fills the piazza, emanating from the surrounding cafes. 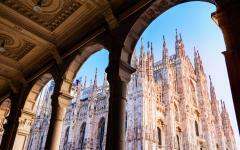 Your private transfer introduces you to Milan and greater Italy beginning at the Armani Silos. The gallery opened in 2015 inside what were once storage facilities for cereals. 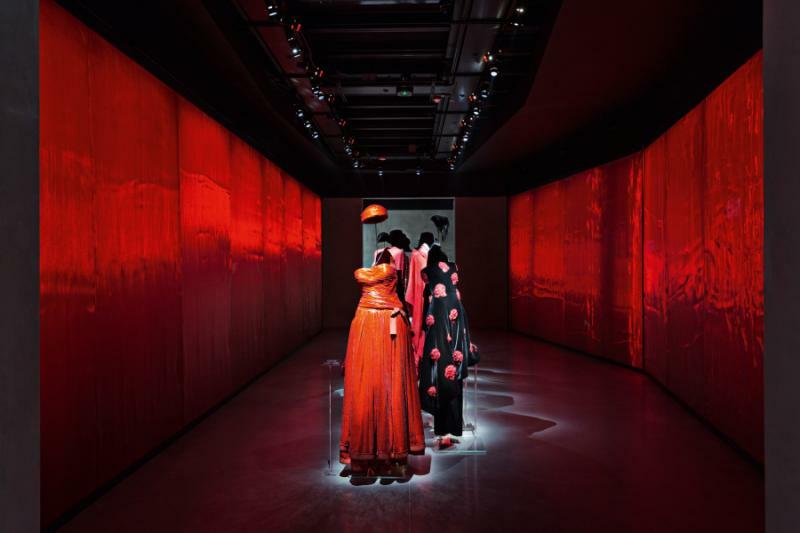 The exhibit now showcases the historic designs of Giorgio Armani, one of the most important Italian fashion designers, and the 40 years of refreshing and insightful projects. The exhibition encompasses four floors spanning approximately 48,500 square feet and featuring 600 outfits and 200 accessories. The geometric shapes decorating the interior create an elaborate aesthetic that contrasts the beehive shape of the original structure. You find a delicate spiced aroma filling the gallery when you reach the second floor, which focuses on the motif of color schemes. Immersing yourself in the world of fashion at the Armani Silos introduces the endless possibilities of Italian design, inspiring you when you arrive at Quadrilatero della Moda, Milan’s Fashion District, where you meet your personal shopper. The trams move along the main boulevard as you stroll down Via Monte Napoleone, an upscale shopping street housing boutique shops specializing in ready-to-wear. The aromas of chocolate and almond tarts emanate through the doors of local cafes. Your personal shopper helps match colors, styles, and design to fit your body shape and skin tone, while also keeping in mind your personal preferences or fashionable desires. The many bars around Milan fill with commuters on their way to work eager to stop for an espresso and sweet brioche before reaching their workplace. The scent of caramelized and buttery puff pastries blends with the rich aroma of freshly brewed coffee for a revitalizing morning scent. After breakfast, your guide greets you in the hotel lobby and escorts you north to the Italian Alps, which act as a natural border between Italy and Switzerland. 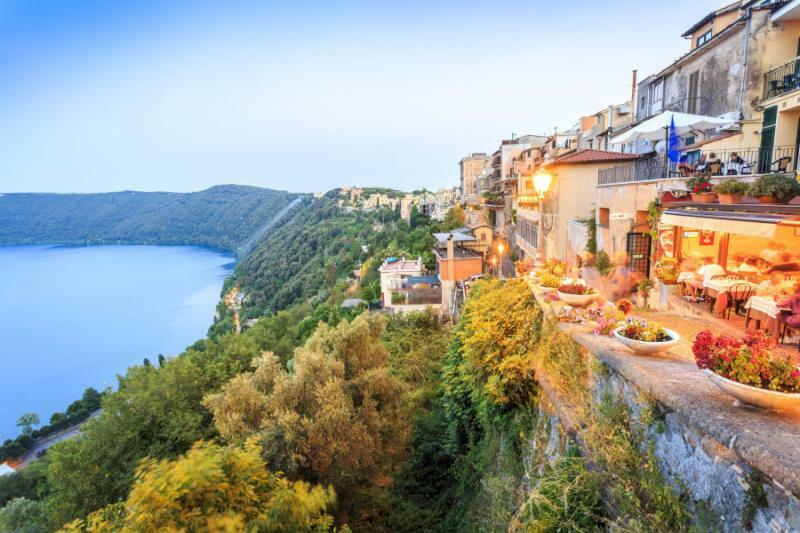 The scenic drive winds along the ascending slopes for less than 30 miles before reaching the tranquil lakeside town of Como. 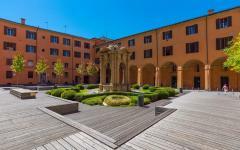 The museum is located inside the Camera di Commercio, the chamber of commerce, with each room dedicated to a different part of the silk production process, including images offering information on the science of silk manufacturing. Italian silk is still considered elegant, ornate, and coveted in the fashion world, with international stars such as Michelle Obama, Angelina Jolie, and fashion designer Stella McCartney often sporting the stylish fabric. You continue to a silk factory to watch how the machines weave the textiles. The first automated weaver in Como was invented in the mid-19th century and follows the same formula in crafting pieces. Watching the elegant threads and variety of colors spin into a single garment is mesmerizing. At the end of the tour, you visit the factory shops known for displaying unique garments as well as tailored shirts, blouses, or dresses from well-known fashion designers. At breakfast, you indulge in a delicious croissant stuffed with cream, accompanied by the bittersweet flavor of a fresh espresso to balance your palate. Your private transfer greets you in the hotel lobby before escorting you to the city of Alba in the region of Piedmont. The city represents the gourmet delicacies of Italy in architecture and cuisine. More than 100 towers punctuate the skyline, reflecting the stature of the medieval community, while the city retains a welcoming, rural ambiance. You arrive at a private farm and meet your guide who is eager to lead you in the hunt for the white truffle. The crisp, damp air sweeps through the forested landscape as you wander through the hills kicking at the remaining moisture spread across the grass. A special dog skilled in finding truffles hidden in the soil leads the pack. 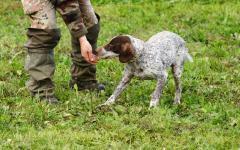 Your guide explains that when the dogs are pups, the owners feed the dog a bit of truffle. The puppies that want more end up becoming hunting dogs that can sniff out the popular cooking ingredient. You find a truffle near the roots of a tree hidden by fallen leaves and chunk of mud. The tubular contains a strong scent of dirt but is known for its intense savory flavor. At lunch, the chef prepares a special meal for you, highlighting the delicious earthiness of the truffle when shaved onto scrambled eggs, melted cheese, beef carpaccio, or simple pasta. You continue into the famous wine-growing region of Barolo, located 10 miles from the city of Alba. The compact town crowns a hill with cobbled lanes leading to the 10th-century foundations of the Castello Falletti. The wine regions of Barolo DOCG (Denominazione di Origine Controllata e Garantita), a designation ensuring the quality and government guarantee of the wines’ origins, includes 11 villages. 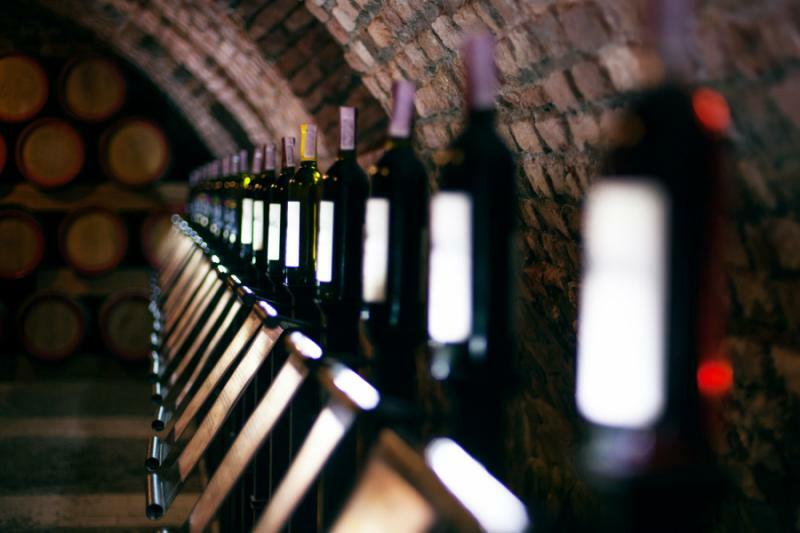 Wines from the region often produce powerful, tannic, and bold flavors that need to age for up to 10 years. You meet your guide on a family-owned vineyard and walk through the vines feeling the waxy texture of the leaves. Your guide pulls a Nebbiolo grape from a bushel and has you try the sweet and sour fruit. The winery dates back to the mid-18th century and has a cellar to match its unique history. The musty scent contains hints of wine and oak. In the tasting room, your guide offers samplings of the variety of wines cultivated on the property, with views of the rolling dales covered in vines. You taste the Barolo, which takes four years to age in large oak barrels. The crimson red color gives way to an elegant aroma of black tea, rose, and cherry. You sip the wine and enjoy the velvety texture accentuating its full body, leaving a long tannic finish. In the morning, you can still remember the gourmet flavors enveloping your palate from the previous day. You sip a frothy cappuccino but remember the full body of the Barolo you had sampled at the winery. After breakfast, you leave the delights of Alba and the culinary delicacies of Piedmont behind, making your way to the gastronomic heart of Italy, Bologna. Before reaching the city lovingly known as “The Fat One,” you venture to Italy’s largest pasta factory, which is also the biggest pasta-making facility in the world, the world-famous Barilla Company located in Parma, which encompasses nearly 13 million square feet. The sleek and welcoming facility creates the classic staple of the Italian diet. The scent of flour and fresh pasta emanates from the factory floor, producing the herbaceous aroma of durum wheat, the main ingredient used to craft the dried and boxed pasta. A large viewing window allows you a direct view of the factory floor with employees and machines working hard to make the variety of pasta for which the company is known. The factory resembles a giant kitchen, which has helped the company lower carbon emissions and water consumption since 2011. The factory produces approximately 300,000 tons of pasta each year. 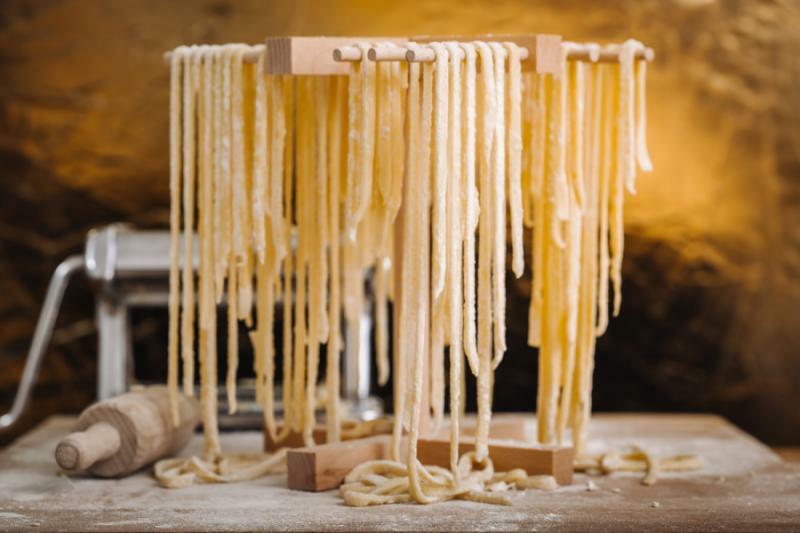 Different machines make different lengths of pasta, with five dedicated to long pasta, such as fettuccini and spaghetti, and six used to make short pasta, like rigatoni and fusilli. You watch as the ingredients get mixed and the pasta shaped, dried, and then boxed with precision. Each pasta product contains a specific design and texture with each noodle meant to capture certain sauces better than others. 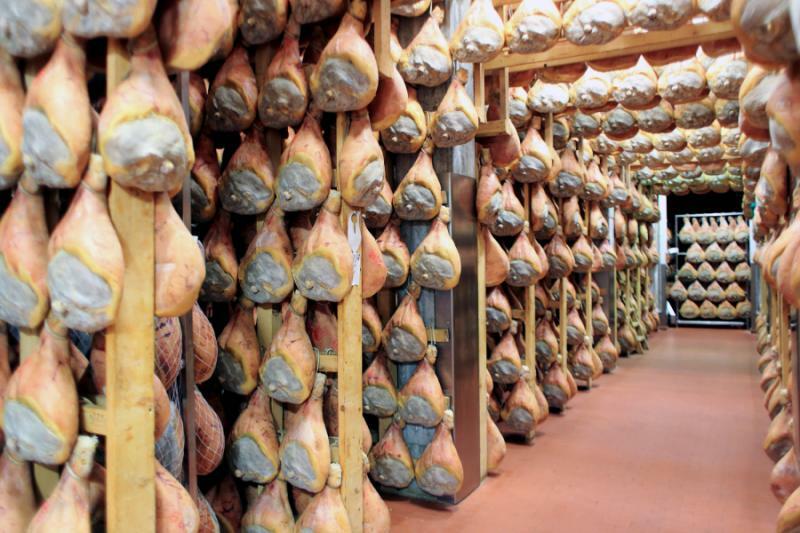 After visiting the remarkable pasta-making factory, you take a look at the more intimate production of Parma’s famous ham, prosciutto. The unique conditions of the province provide the aged ham with its distinctive flavors taken from the elements of the Apennine foothills and the seaborne breeze. 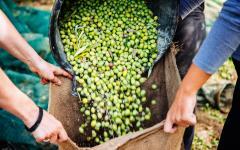 Producers in the region claim that their secret recipe is salt, air, and time. Your guide leads you through the process of crafting the famous Parma ham. After visiting the grazing area, as well as the rooms in which the farmer chooses the fresh haunches to salt, you watch as the farmer adds only enough salt to the pork to preserve the leg over time and not dry out the meat completely. The trimmed meat will lose over a quarter of its total weight after the moisture dissipates, which concentrates the flavor. The first salting covers the skin with humid sea salt before leaving the haunches in a refrigerated area between 33 degrees and 39 degrees Fahrenheit. It rests for up to 90 days before its second washing and drying. The outer layer gets covered in grease to keep it moist while still open to absorbing the outside elements. You walk into the cellar and notice the musty scent fading beneath the clear aroma of aging prosciutto. The legs dangle for at least one year but can cure for up to three years. 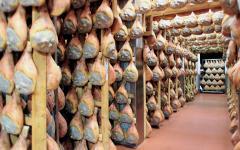 Your guide offers you a sample of the prosciutto the property produces inside the tasting room. The delicate mixture of fat, earthiness, and salt makes your mouth water. 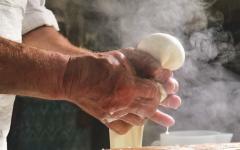 You wake up excited to begin a full day exploring the craftsmanship of the Emilia Romagna region of Italy. Your private driver escorts you from the city of Bologna in the morning to a cheese factory. 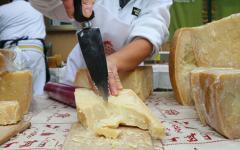 You visit a traditional producer known as one of the 384 authorized Parmigiano-Reggiano cheese-makers in the region. The factory has worked since the 13th century when first operated by monks who produced authentic, large wheels by hand. The factory continues the practices of using fresh ingredients with no added preservatives. You cover yourself with the protective garments to shield the production from possible contamination and enter into the grounds. Despite the amount of milk boiling in large vats, you find the first room absent of an aroma. Your guide explains unpasteurized milk is delivered to the factory within two hours of the cows’ milking twice a day. The milk rests overnight so the cream can rise to the top, which is then removed by morning. The mixture from the morning is then mixed in a cauldron to produce whey, which coagulates at 102 degrees Fahrenheit. Curds sink to the bottom when the cauldron reaches 125 degrees Fahrenheit. After the process, the cheese-makers use muslin cloths to help drain the heavy ball of cheese from the moisture and remaining whey. You pass through the shaping room, move beyond the brining room, and into the warehouse to find a bank of cheese wheels weighing approximately 75 pounds each. The wheels rest for at least 12 months before being checked for quality with a hammer known as a battitori. Any moldy cheese goes to the pigs, but your guide opens up a new, quality wheel to sample in the shop, finding crumbly cheese with a gritty texture and fruity, nutty flavor. You continue to an acetaia, a factory known for making balsamic vinegar. Your host leads you to the backyard of his or her large home to show two vine-trees spreading across a pergola. While the antique trees continue to produce grapes, the majority of the grapes used in their balsamic vinegar derive from the nearby vineyard. The traditional history of balsamic vinegar is rooted deep in the province of Modena and the greater regain of Emilia Romagna. 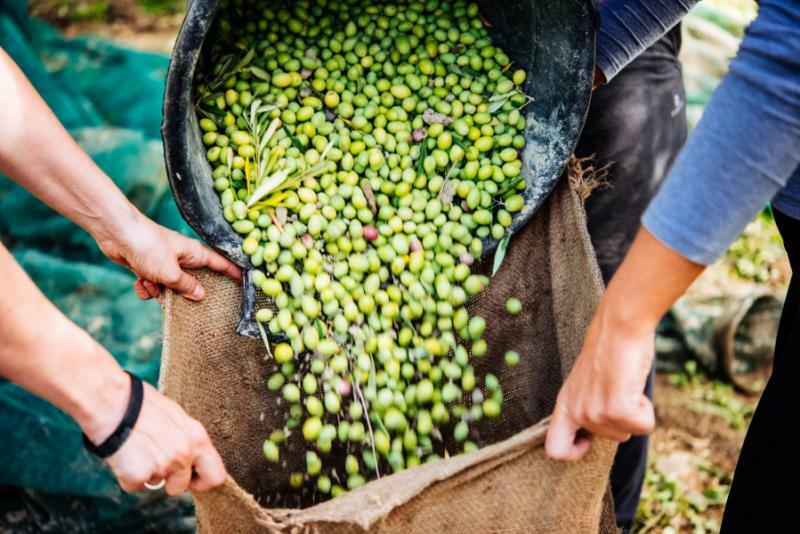 Locals pass down the legend that the Romans made similar honey-like syrup from grapes called saba, which evolved over time to become balsamic vinegar through the use of different grapes and the fermenting or aging process. Your guide leads you through the production line from pushing bushels of grapes to pressing out the juice, heating the mixture, and aging the remains in oak barrels. A white cloth at the top of the barrels is meant to avoid evaporation. You enter the cozy tasting room and sample the different stages of vinegar, from the fresh syrup—which has a sweet and very tart flavor with a thick body--to the final, aged product, which has a complex flavor of fig, molasses, and chocolate with a light, thin body. 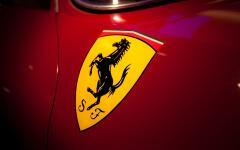 Ferrari is one Italian legend that can match Parmigiano-Reggiano in its fame and attention to artisanal detail. After sampling the cheese in the tasting room, you continue to the Ferrari Museum to walk along the visible timeline of the celebrated sports car. 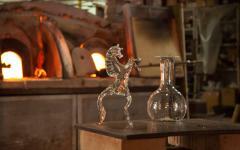 The emblem of the dancing horse exemplifies a style dedicated to elegance and artistry. The factory produced its first car in 1947 and has since designed at least 233 different models. 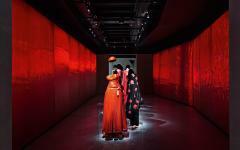 The museum hosts state of the art interactive exhibits as well as displays of their famous models. For a thrilling experience, you climb into the cockpit of an F1 single-seater during a semi-professional simulator. The engine roars, the seat rumbles, and the full-screen display in front of the car takes you to Monza, Barcelona, or Zandvoort. The track surface changes with your destination and allows you to feel the sensitivity of the throttle and brake while you drive. While the racetrack might contain the scent of burnt rubber or wet asphalt, after driving in the simulator, you find the pleasant aroma of espresso drifting out of the café inside the museum. 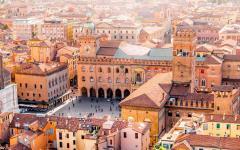 The quality of cuisine in Bologna and Emilia Romagna attracts visitors from around the different regions of Italy interested in sampling the delicious flavors for which the region is known. In 2017, the grand food-themed amusement park known as Eataly opened in the city, allowing visitors to get lost in a culinary adventure spanning 25 acres, which includes a dairy plant, livestock stalls housing cows, goats, and chickens, as well as a small forest where trained dogs showcase their skills hunting for truffles. The theme park represents the traditions of Italy and the inspiring dedication to the slow food movement. Department stores display different types of kitchenware, olive trees, and grains grow on hydroponic agrifarms, and micro-factories produce Italian craft beer or mill rice and flour. The aromas drifting out of the different shops and restaurants are distinct in their layers but also complement one another, such as the sweet molasses of balsamic vinegar blending with the nutty aroma of Parmesan cheese. The confectionary Venchi, first opened in 1878 in Turin, is one of the most famous chocolateries in Italy, crafting decadent deserts including chocolate bars, hazelnut and chocolate spreads, and gelato. The shop in Eataly fills with the decadent aroma of dark chocolate. Your instructor welcomes you with a sample of the confection untamed by the combination of sugar or milk where you can taste the bitterness of raw cacao. You learn the history of chocolate in Italy, which originated in a chocolate house permitted by the Royal House of Savoy in the 1670s. Your instructor leads you through the process of crafting the chocolate, from grinding the beans to adding sugar and ingredients that enhance the flavor from the bitterness of the raw cacao. The chocolate should have a radiant sheen ranging from brown to light pink, which informs chocolatiers on the flavor. The texture can range from smooth to grainy, creamy to coarse. The aroma layers the profile of the chocolate. A clean snap lets the producer know the chocolate is ready to eat. You sip a glass of water to clean your palate before letting the sample rest on your tongue and melt slowly coating your taste buds. At the Ducati Factory, the day takes a turn from the delicate culinary beauty of the region to the artistic power and integrity of designing and producing the iconic motorcycle. The legendary brand has a 90-year history of speed, force, and style embodying more than just a motorcycle but a work of art. Near the end of World War II, Ducati shifted their focus from producing radio components to motorcycles, building their first engine in 1944. The small production turned a bicycle into a two-gear motor scooter able to reach 30 miles an hour on an open road. 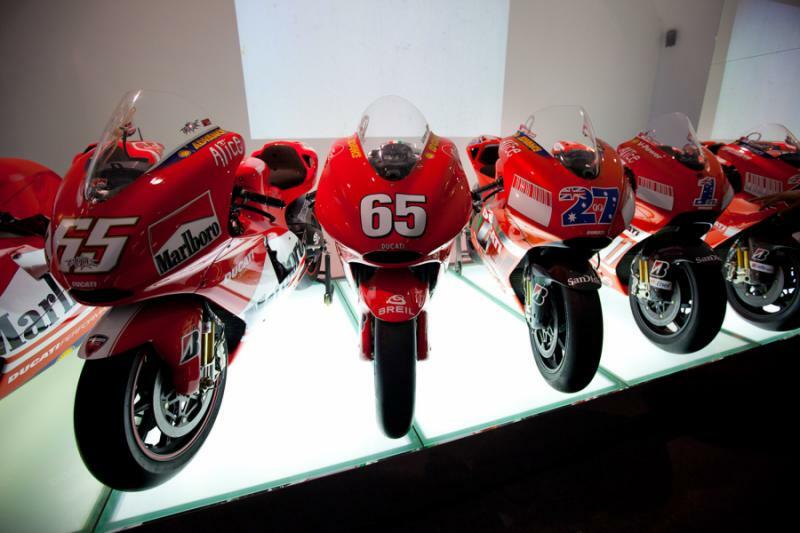 You wander through the gallery of the museum, exploring the evolution of Ducati over time before entering the factory, giving you an extra appreciation for the statuesque beauty that can reach speeds of nearly 170 miles per hour. Meet with workers along the factory line as they test the torque and gear duct before completing the engine. They now use a Bluetooth-enabled wrench to give the engineer an immediate measure of the applicable torque when structuring the interior. You hear the roar of the engine as a professional driver revs a new motorcycle before it returns to a stable purr. 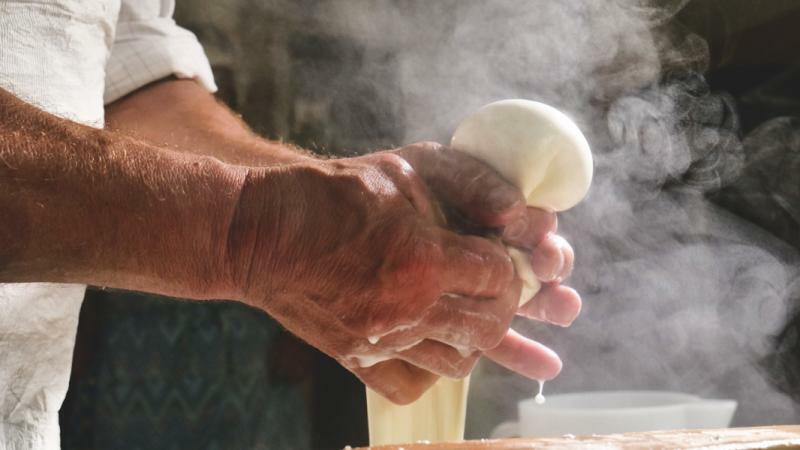 Note: Be sure to ask our Zicasso specialists about other cooking classes at Eataly, such as making olive oil, cannoli (the Sicilian pastry), or if traveling with children, learning how to make gelato, an Italian favorite. 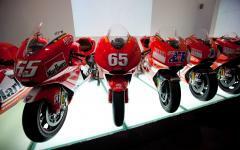 Your experience with Italy’s exceptional mechanical expertise does not have to end at the Ducati Factory. The Ferrari experience allowed you to explore the quality of design in a simulator but you could have a more intimate interaction with the elegance of Ferrari if you choose to partake in the Ferrari F458 on Road Tour. Instead of simulating the events of racing on an F1 track somewhere in the world, you will step behind the wheel of a Ferrari 458 Italia, which can reach speeds of over 200 miles per hour, produce 562 horsepower to kilowatts with nearly 400 pounds of torque. The car is the newest and most sophisticated Ferrari to date and combines gorgeous exterior design with graceful handling. Speed on the motorway for five, seven, or 20 laps. Perhaps you have never been a fan of the Ferrari brand and have always preferred the elegance and serene appeal of Lamborghini. 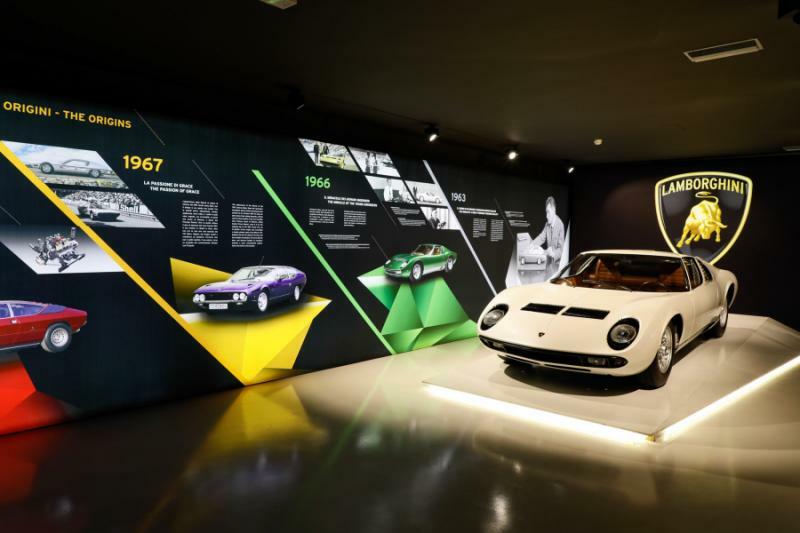 Visiting the Lamborghini Museum takes you through the historical arcades of Bologna’s city center to explore the stunning history of the luxury car brand dating back to the 1960s. Large windows overlook the factory grounds and frame the vintage cars displayed over two floors. Many of the cars on display are from the founder’s personal collection and represent 50 years of care. Learn about how Ferruccio Lamborghini started the car company out of frustration with Enzo Ferrari and gaze down upon the production line as workers assemble a luxury car as they assemble a V12 Aventador engine. The luxury Italian vehicle brand Pagani is known for its exclusivity, design, and elegance. Only 100 of their newest car, the Huayra Roadster, will be produced, and all of them have already been sold. Each car can reach nearly 220 miles per hour and contain six-liter engines built strictly by hand. A guided tour of the factory and museum takes you onto the showroom floor; unlatch the trunk to reveal the interior of the car, as if opening a wing of a spacecraft. Engineers, designers, and assembly workers working for the company are more than staff; instead they are artists and craftspeople using their tools to create captivating artwork. Although Italy is known for a number of luxury cars straddling iconic artwork more than vehicles, not every person visiting Italy is a fan of the medium. Instead of spending time on in the museums of Ferrari, Lamborghini, or Pagani, you could enjoy a cooking class that enhances your own skills in the kitchen to those of artisan chefs accomplished in the traditions of an Italian kitchen. Your private chef will meet you at the hotel and tour you through the local market to choose the freshest Italian ingredients. 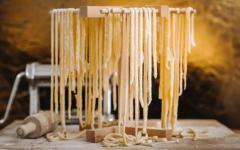 Spend time learning the recipes and preparing your ingredients for a number of different dishes used in a four-course meal, including a specialty pasta for which the region of Emilia Romagna is known. The city of Florence encapsulates the Italian Renaissance in the artworks displayed in museums like the Uffizi Gallery and the Accademia, represents the splendors of architecture in the fascinating dome of the central cathedral, and retains elements of medieval design in remnants of the city walls surrounding the heart of the city. Streets south of the Arno River follow the ancient Roman grid and hide the artisan workshops in the district known as the Oltrarno. You arrive in Florence in the morning to enjoy the bustling ambiance along the cobblestone lanes circling around the iconic image of the Duomo and leading to the public square of Piazza della Signoria, over which the façade of Palazzo Vecchio towers. 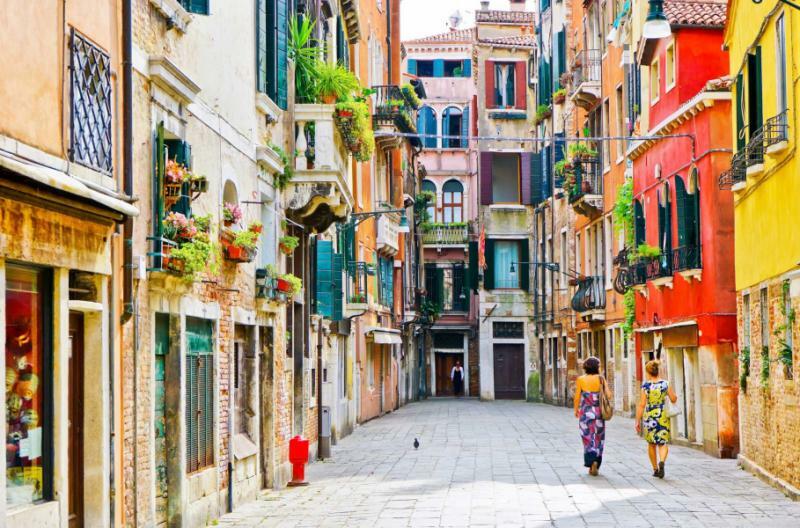 Your guide leads you on an introductory tour through the antique architecture of the city, winding through the streets filled with the aromas of stone from the streets and espresso from the numerous cafes. The Ponte Vecchio, also known as the Old Bridge, was reconstructed in the 14th century after a flood destroyed the original Roman bridge. Shops line the structure arching over the Arno River connecting the banks separating the city. The bridge spans 310 feet, giving plenty of space to jewelers and art dealers who continue to populate the commercial space. Gold shimmers in the display cases, and silver decorates the windows. The ceilings of an antique shop grow lower on each floor of the three-story shop; a quiet remark on the size of residents over five centuries ago. A jeweler continues in the tradition of her family since the 19th century, using bristling drills, wads of wax, and wire spools, as well as a small forge hidden in the corner of the workroom situated above the shop at street-level. You can take a look at the workshop, which hosts an illustrious view over the Ponte Vecchio reminding you of the bridge, city, and workshop’s magnificent history once hosting a multitude of master jewelers. You spend time visiting the artisan craftspeople in the Oltrarno district who specialize in mosaics made from semi-precious stone, leather work, decorative papers, and customized jewelry. Each craftsperson dedicates their time and energy to creating artistic handcrafted goods, tinkering in traditional shops along the medieval avenues. The aroma of leather fills the binding shops, and precious stones glint in the soft light of the mosaic workshops. After viewing the different shops and meeting with artisans happy to let you view their work, you stop in a perfume shop. The master perfume-maker introduces you to the subtlety of aromas and the ways in which different oils can react to form pleasant aromas. You sample the various ingredients listening to the ways the artisan chooses his or her particular perfumes before you select your personalized scents. The shop is located in a building dating back to the 18th century and contains a historical and majestic ambiance accentuating the works of Catherine de Medici. You work like an alchemist to create your own scent representing your personality in a particular aroma. The mornings in Florence have a quiet ambiance before the museums open for the day. Locals fill the corner bars before work, snacking on a sweet brioche and sipping a strong, rejuvenating cup of espresso. Crew members row on the Arno River at sunrise before crowds fill the cobblestone plaza leading to the Uffizi Gallery. 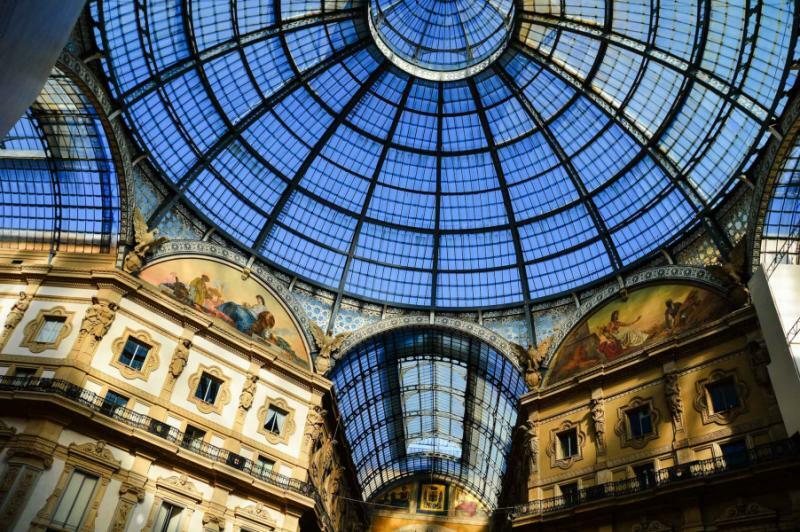 After breakfast, your guide introduces you to the splendors of Salvatore Ferragamo in the Ferragamo Museum located in the basement of Palazzo Spini Feroni. For over 20 years, the museum has illustrated the artistic integrity and unique designs giving the fashion brand a distinctive role in the history of shoes and design in an industry devoted to ever-evolving style. The collection displays photographs, patens, sketches, books, magazines, and approximately 10,000 models designed by Ferragamo between the 1920s and 1960s; not even including the wooden lasts used for shaping the shoes of famous women and men over the years, such as Greta Garbo, Sophia Loren, Audrey Hepburn, and the Duchess of Windsor. The museum continues in the tradition of its founder’s connection to the arts by hosting exhibitions local and international art and culture. Ferragamo’s passion for shoes embodies an inspiring vision of artistry taken from both likely and unlikely places. The craftsmanship of Italian artisans leads you over the familiar cobblestones of the Ponte Vecchio and back to the hidden avenues of the Oltrarno neighborhood to meet with a local cobbler skilled in the art of fashioning custom shoes. The artisan welcomes you into their shop with a friendly smile, eager to introduce you to their studio, which hosts a collection of wooden lasts covering the wall-like mural. The scent of leather emanates from the walls. Each shoe produced in the workshop contains an identity unique to the cobbler and the wearer from diversity in style to shape for a personalized look. 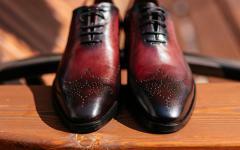 You discuss the type of shoe you prefer before the cobbler measures your feet and creates a thrilling design. Instead of waiting for the cobbler to complete the shoe and carrying an extra box around Italy, he takes your address and ships the handmade and stylized garment to your home for a fun, smooth, exciting, and effortless process. 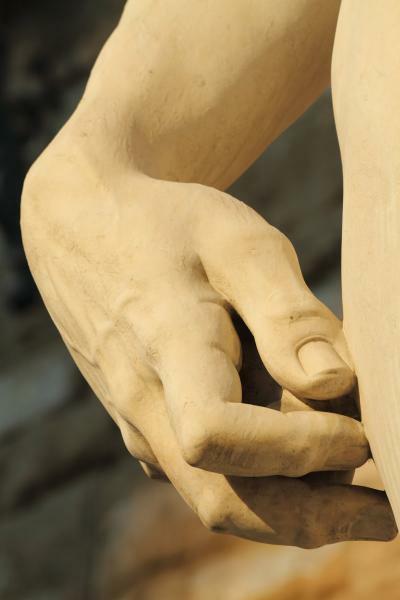 Florence has a tranquil atmosphere in the morning before the museums open, and the crowds line up to view Michelangelo’s famous sculpture of David in the Accademia Gallery. 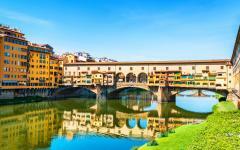 You sip a frothy cappuccino at breakfast, indulging in the rich flavor and view of the Ponte Vecchio. You leave Florence soon after the meal, venturing to the treasured city of Venice, stopping first in the town of Arzignano, located in the province of Vicenza. While the town retains similar charm as others of its size in Northern Italy, Arzignano boasts a spectacular leather trade, most famously crafting the band and source of the material for the Leather Loop, a component of the Apple Watch. Artisan heritage in the leather trade of Arzignano spans five generations, using delicate milling techniques and a tumbling process to enhance the pebbled texture of the chosen material. Traditional crafts artisans in the area have learned innovative techniques of design, including how to quilt leather, the method used in crafting the Leather Loop. An artisan invites you into their shop in which they specialize in making jackets, shoes, and belts. The scent of leather polish fills the studio with finished jackets and boots gleaming in the window. After the demonstration, you continue to the remarkable villas on the outskirts of Vicenza designed by the renowned 16th-century architect Andrea Palladio. The collection of villas is located along the banks of the Brenta Canal, a waterway leading to the Venetian Lagoon. You make a visit to a Veneto winery where your guide is delighted to share the winery's premier wines for a tasting. Upon reaching the waters of Venetian Lagoon, a private boat meets you on the dock and escorts you over the famed Grand Canal to reach your luxurious hotel overlooking the grandeur of Venice. 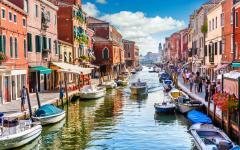 The morning in Venice brings crowds to the bustling Rialto Market, located at the edge of the famed Rialto Bridge. An antique marble plaque lists the rules of the marketplace as set by the Doge of Venice in the 16th century. Vendors continue to sell fresh produce, such as pears and apples, as well as fish caught earlier that day, with sardines, prawns, and squid among the most popular. You board a private boat after breakfast and glide down the Grand Canal in view of the famous onion domes of St. Mark’s Basilica. The bell tower, known in Italian as the campanile, stands nearly 325 feet tall. The water on the lagoon has a briny aroma overtaking the sweet scent of brioche emanating from the quiet cafes and bakeries along the waterway. 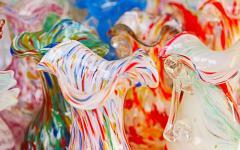 You reach the island of Murano, which is known for its history of fascinating artisanal glassblowing. 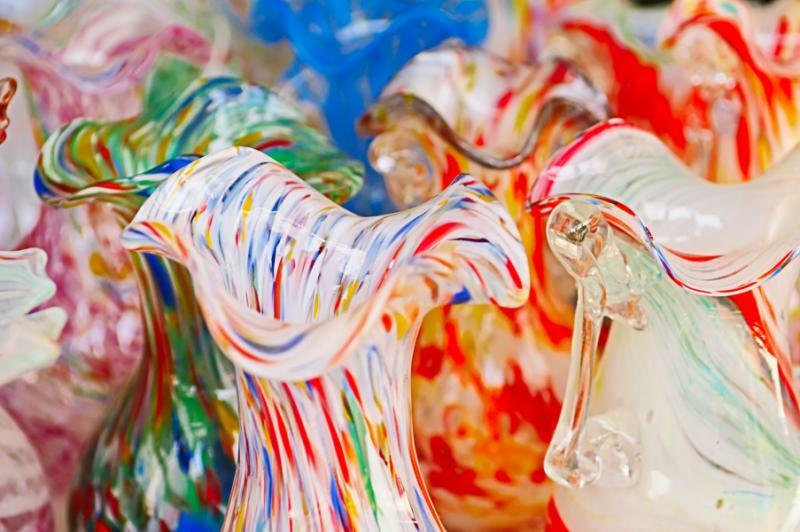 The history of the artistry dates back to the 9th century, with artisans transferring to the island of Murano during the late-13th century after the Doge decreed furnaces could no longer stay in the main city due to a fear of fires. A narrow canal runs through the heart of the island leading beneath arching bridges and allowing locals to moor their small boats along the cobbled lanes. The bell tower of San Pietro Martire was erected between the 15th and 16th centuries on an island spanning less than 1,135 acres. 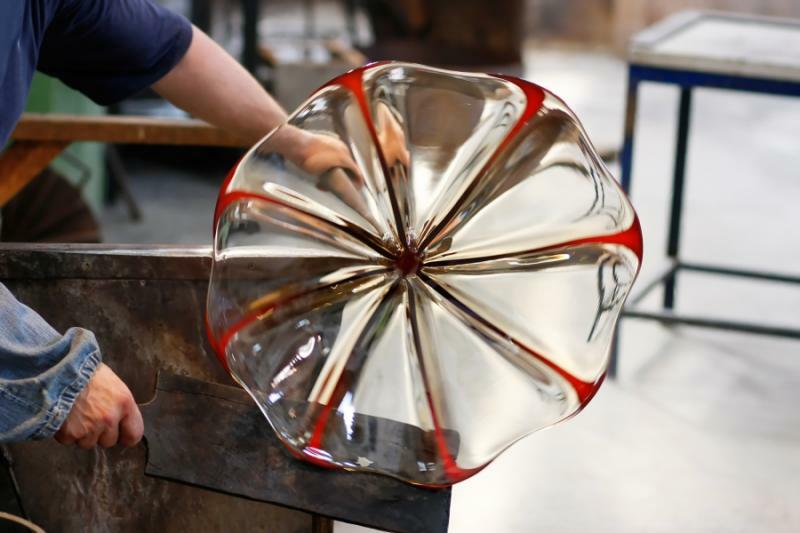 Heat emanates from glassblowing studios with artisans working to produce pieces of various sizes and purpose, from vases to glasses, plates to sculptures and chandeliers. 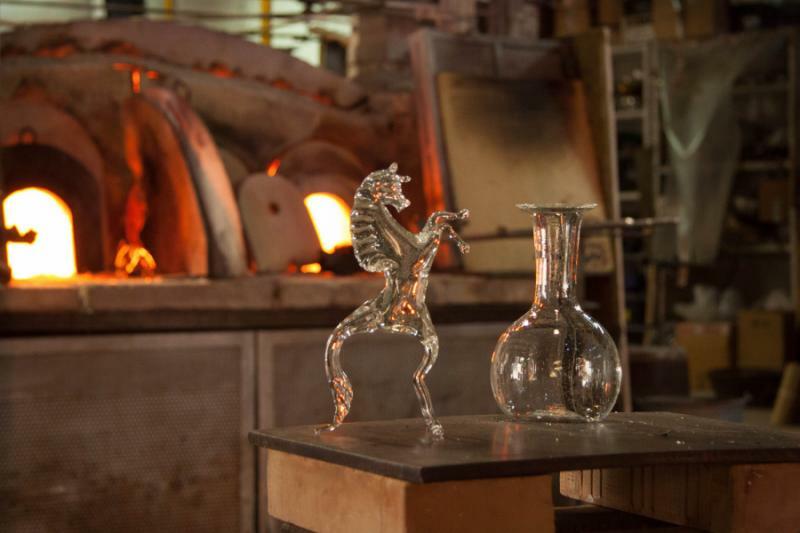 Your instructor offers you a demonstration of the glassblowing technique before guiding your hands to shape molten glass. The heat from the furnace makes the post and glass glow bright red. Your guide takes a thick cloth to smooth the shape of the glass as you continue making an unforgettable souvenir. 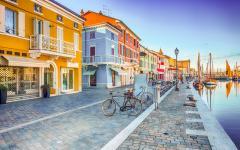 You continue to the island of Burano, where colorful homes add vibrant life to the narrow lanes overlooking the canal. The island has a tradition of hand embroidery, which started with housewives stitching in the doorways while looking out to the water waiting for their husbands to return from fishing in the open sea. 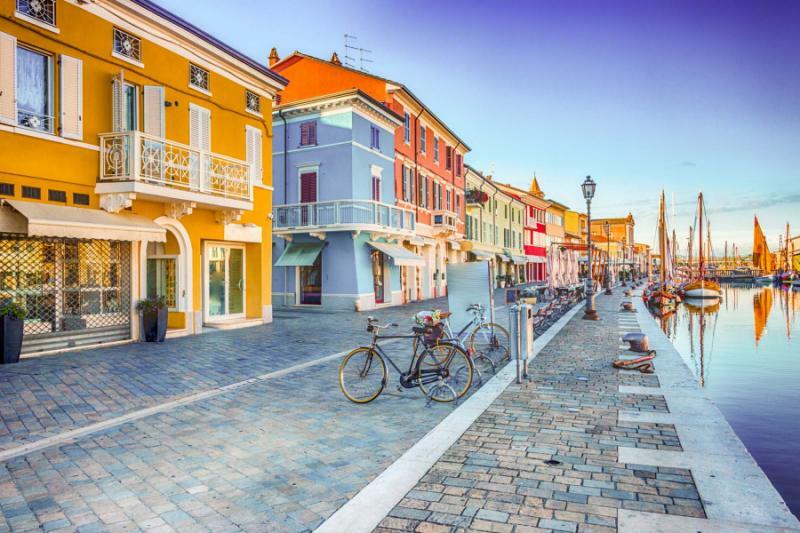 Locals of the island continue to ride their bikes along the colorful pathways, stroll beneath the towering campanile, and embroider lace while chatting in the public squares. You venture to the oldest lace shop on the island, which pride itself on the quality of their hand-stitched lace, producing pieces for beds, centerpieces, or nightgowns. The morning light spreads over the bulbous domes of St. Mark’s Basilica and glints against the gold-leaf accents along the concaved archways of the face. The marble pillars of the Doge’s Palace feature the iconic architectural adornments of Venetian Gothic architecture. Hand-painted Venetian masks garnish the windows along the streets of the city reflecting the lavish tradition Venetian Carnival. 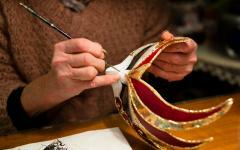 You have the option to create your own Venetian Carnival mask by attending a class taught by a local artisan. At breakfast, you indulge in a fresh brioche stuffed with chocolate and sip an espresso to balance the sweet with the slightly bitter taste of coffee. After the meal, your private water taxi greets you on the dock of your hotel and escorts you to the mainland to continue onward to Marco Polo Airport for your flight home. "The company found us unique experiences..."
"We only have positive things to say about the travel company that we found through Zicasso." "Amazing company to work with." "Our travel agent was very helpful and always provided prompt assistance when required." "Overall, we had a wonderful time in Italy."